J.R.R. Tolkien is one of my favorite authors, so you’ll have to forgive me if this isn’t so much a review as it is geeking out, followed by more geeking out. 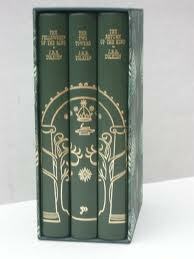 I read The Lord of the Rings trilogy roughly once a year and I never get tired of it. Tolkien is just a damn good story-teller. I won’t even bother with summarizing the plot here. Read the books, or watch the movies (which are a passable substitutes, but you’ll miss the detail present in the novels themselves). Tolkien’s style is like poetry turned into prose; the narrative is almost melodic. The author was primarily a linguist, and it shows. Hell, the guy created languages, not to mention histories, cultures, and creatures that fantasy writers still use. It’s almost as if, instead of making the stories up, he watched them unfold and wrote it all down. You’d think, in a thousand-page trilogy, that the author would have to ramble at some point to fill up space, but Tolkien never does. Every line is written purposefully and beautifully. If you haven’t read the books, obviously I highly recommend it. I promise you won’t turn into a super-nerd. But if you do, it’ll be worth it. This entry was posted on November 16, 2010 at 12:56 am and is filed under book reviews with tags books, j.r.r. tolkien, lord of the rings, reviews. You can follow any responses to this entry through the RSS 2.0 feed. You can leave a response, or trackback from your own site. Who doesn’t love a bit of nerding out 🙂 I love those editions pictured above and I want them!